The Feng Shui Bagua Map reveals secrets hidden in your living space. Use this Feng Shui Bagua Map to"read your living space". The Bagua takes it's shape and meaning from the I Ching which is the result of human attempts to understand the laws of nature that affected their lives. They developed a system of symbols called trigrams to represent the energy expressions of nature. They are represented as water, mountain, wood, wind, fire, earth, metal and heaven. These trigrams also express various stages of a situation. They give deep insights into your "life situations" reflected in your living space. Each life situation in this Feng Shui Bagua Map is represented by a circle. There are eight life situations and the center, which results in nine circles all relative to each other. All life challenges and patterns are held in your living space. Did you realize that the space where you chose to live was not an accident? Yes, it is true. The good news is that hidden in your home are also the solutions to these limiting patterns. This Feng Shui Bagua Map is not a traditional tool. It is rather a "compass of the heart." It is not to be read according to modern compass directions, yet it honors the directional energies as did the ancients. The relative position to your front entry door determines the placement on your living space. The bagua of the heart is an instinctive sense of awareness that comes when you memorize this Feng Shui Bagua Map. You are then able to view your living space through the eyes of Feng Shui with a compassionate heart. Now it is time to draw your floor plan and see what is reflected in the place where you live. If you see a missing area (like in the illustration) you are missing energy in that life situation. This mirrors a personal energy pattern that holds powerful secrets just for you. Click on that life situation in the menu for tips to empower that area and change that situation in your life. 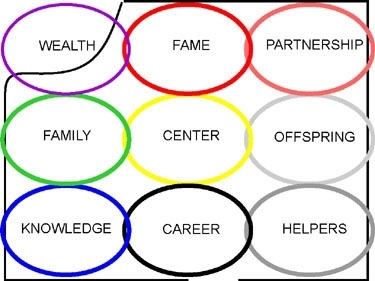 These are the life situation areas on the Feng Shui Bagua Map. Career: What we do in the world for a paycheck, or to follow our passions, or both. Knowledge: Information we know, self knowledge and cultivation, decision making ability. Family: Includes our family of origin, our immediate families and other groups we may belong to that feel like family. Wealth: Symbolized by money in this tradition. Includes our issues about abundance and what we value. Fame: How we are seen by the world, how we see our selves, our reputation, that our name is held in high esteem. Partnership: Relates to committed relationships with others, with ourselves, with the earth. Offspring: Refers to children and creativity. What gifts we leave behind. Helpers: Clients, angels, professional services. Travel and long journeys. 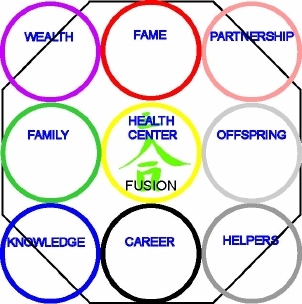 The Center: Health and all life situations. So, go ahead and draw your floor plan and see what is reflected in your space. Use your intuition and play with ideas. Contact us with questions or if you are interested in a Feng Shui floor plan reading by Valerie. Information on Feng Shui Colors and Feng Shui Elements are on the way. Learn how to use them to change those limiting patterns mirrored in your living space.